The historic building’s brick foundations and brick sub-grade walls, combined with the site’s glacial geology, caused serious and widespread interior infiltration and damage. 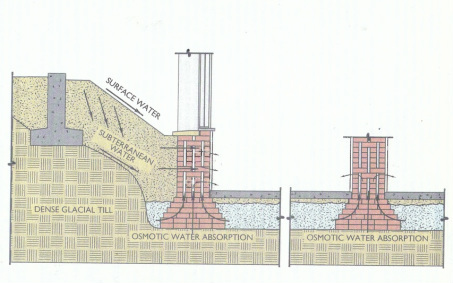 The sub-grade infiltration related to this building’s brick foundation system and was greatly exacerbated by the site’s dense, impermeable glacial till geology. PL:BECS provided detailed construction drawings depicting a multi-layered strategy of waterproofing, drainage enhancements, chemical grout injection, soil encapsulation, and other measures to address this challenging leak problem. Project Summary:	This beautiful 19th century historic brick masonry building had been experiencing leakage throughout much of its basement level. 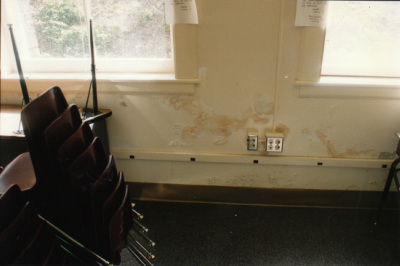 The problem had persisted for decades, and worsened after a major renovation. Symptoms included continual damage to interior plaster finishes, wet carpets, blistering polyurethane floors, and paint damage. PL:BECS Services:	PL:BECS provided services in several phases. The first phase consisted of determining the problem’s causes and recommend specific corrective actions to solve the leakage. In the second phase, PL:BECS prepared detailed construction drawings and specifications to describe the needed corrective work, and supervised the work’s execution. 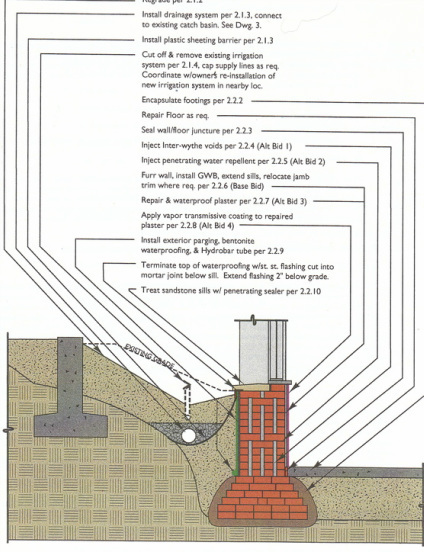 The evaluation concluded that this persistent infiltration problem resulted from this building’s permeable brick foundation system, combined with the site’s dense glacial till geology. The original excavation for the building created a sub-terranean pool, immersing the building’s basement in year-round moisture. The combination of the site geology and topography, the building’s construction technology and materials, and constrained access to sub-grade locations made this a very challenging project, requiring a mix of multi-layered exterior waterproofing, drainage systems, chemical grout injection, soil encapsulation, and other measures.